Tea Happiness- A blog on tea drinking, tea history, tea industry interviews, NYC tea experiences! 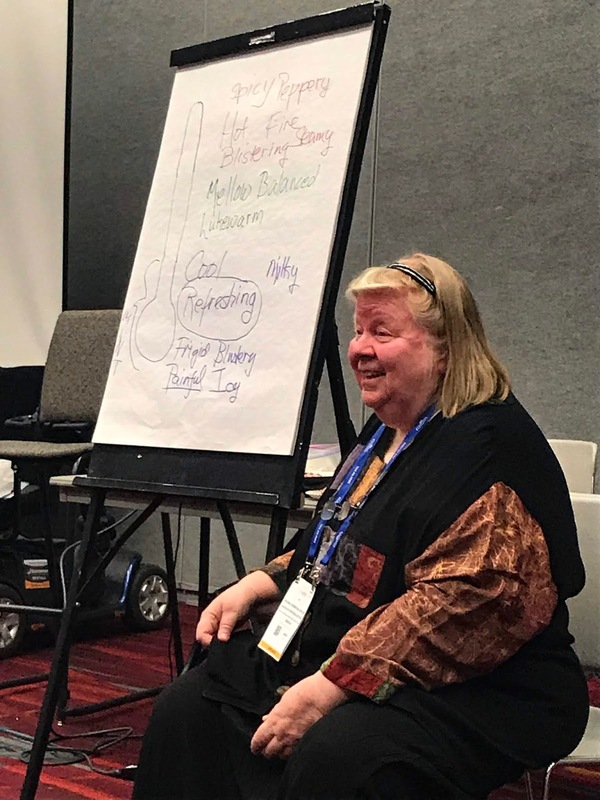 : World Tea Expo 2018: Tea Pairing Workshop with Virginia Utermohlen Lovelace M.D. 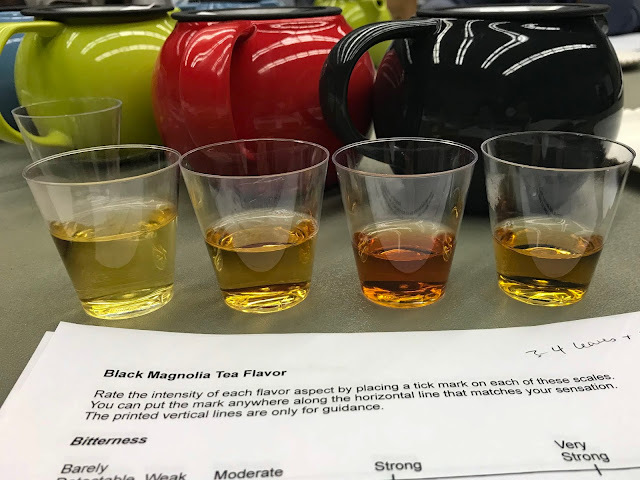 World Tea Expo 2018: Tea Pairing Workshop with Virginia Utermohlen Lovelace M.D. One of the most memorable experiences I had at World Tea Expo this year was attending the workshop "Learn To Pair Teas & Build Menus from Scratch" with Virginia Utermohlen Lovelace, M.D. Virginia uses science to explain the art of pairing tea and food, and she is an expert instructor. I love pairing tea and food, as you can tell from the Tea Pairing 101 series I've been doing with Jee and Georgia. Our approach is a bit subjective, as taste is very personal. Actually, if you peruse Virginia's blog, you will see that she takes each of our pairing sessions and explains our findings with science! 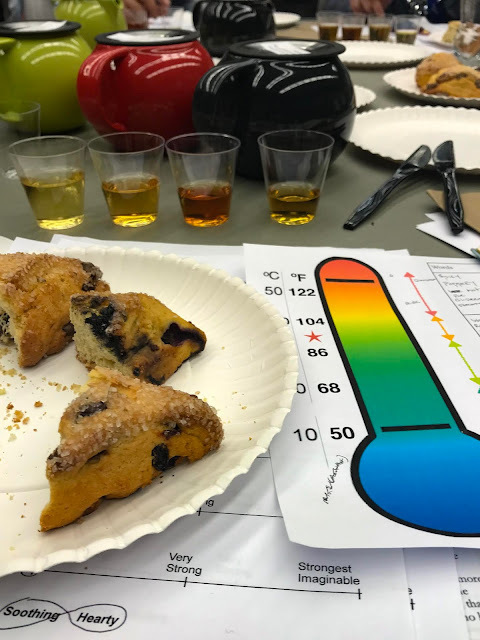 Virginia's workshop also brought this fascinating scientific approach to tea pairing, and I couldn't believe how useful the information is. The first thing we learned was how the chemicals in food activates our Trigeminal nerve temperature receptors. Basically, flavors we taste will be detected on a temperature scale! Thinking of flavors in terms of temperature is fascinating to me. We discussed words for how we detect the flavors. For example, spicy and peppery foods are on the hottest end of the temperature scale, then drop in temperature to sweet and umami flavors, then down to mellow and balanced foods, finally to cool and milky, refreshing, frozen, and pungent foods at the coolest end of the spectrum. It's important to consider the 'temperature' of the flavors in a dish when selecting a tea to pair it with. Think of a chili pepper vs. a cucumber. They are opposite on the temperature spectrum, and therefore will require a different tea pairing. Flavors that are opposite on the temperature spectrum may not work well together, or they even can cancel each other out. Just as you can't feel hot and cool simultaneously, you cannot taste a 'hot' and a 'cold' food at the same time. To illustrate this point, Virginia had us put a cinnamon candy in our mouths for a few seconds to get the flavor, and then taste a mint. The minty flavor completely masked the cinnamon! You can't taste them both at the same time. The trigeminal receptors detected the cinnamon as hot, and the mint as cool. Hot receptors are slow to develop, but they linger. The cool receptors are much faster to turn on and off, so once the flavor of the mint candy dissipated, the cinnamon flavor came right back! It actually lingered for quite some time. If paired correctly, food will enhance the tea you are drinking, but if incorrect, flavors can be inhibited. Yatra Fatikcherry Estate Tripura Green Tea, Autumn 2017- Virginia asked for this tea to be a bit oversteeped, so we could taste the astringency. I noted this tea as 'moderate' in bitterness, astringency, and low in sweetness and other flavors. The best part came next- we were asked to taste the tea, and then taste a tiny bit of salt. When I tried this, I actually gasped out loud. The bitterness completely disappeared! I could now taste the floral and green notes of this tea. With the addition of salt it became a 'soothing' tea, flavors were fairly balanced and nothing was particularly dominant. This put the tea in the 'cool' to 'middle' temperature range. I am definitely going to remember how salt masked the bitterness and astringency. Pro tip: In my notes I wrote that both salty and vanilla flavors tame bitterness. Yatra Goomtee Estate First Flush Darjeeling, April 2017- this tea also hit the 'middle' temperatures for me. It was not bitter or astringent, but delicate with sweet, nutty, and floral notes. Virginia pointed out that first flush Darjeelings are in a similar temperature level as oolongs, activating the 'medium-warm' trigeminal nerve receptors. This made sense to me, since they are both partially oxidized (just as there is a range of oxidation, there is also a range of medium temperatures). Yatra Halmari Estate Second Flush Assam, 2017- my note for this tea is 'hearty'. It was strong in sweetness and nuttiness. It wasn't super astringent though. A rich black tea such as this assam activates the warmer temperature receptors, for sure. Great Mississippi Tea Company Black Magnolia- I've had this tea before, and really enjoy it. My notes for this tea includes no bitterness, with moderate sweetness, and strong nuttiness. I circled both 'soothing' and 'hearty' on my rating sheet, as it's sort of in-between. It's not as 'hot' as an Assam; it's more delicate, but still on the hotter end of the temperature spectrum. Snack time! After assessing the teas alone, we then paired them with a few different bites. We had blueberry, raisin, and chocolate scones, along with blueberry, strawberry, and raspberry jams. The variety of scones were important, as pairing tea and scones is a classic afternoon tea choice. But not all scones go with all teas! When creating a tea menu you need to decide what flavors you'd like to emphasize, and what flavors to dampen. Then you can start to figure out how to pair. Green tea went really well with blueberry! The sweetness of the tea was enhanced, and the bitterness disappeared. The green flavors were also highlighted with the blueberry. So if you are selecting a scone to go with your green tea, go for blueberry if you can! The other teas didn't work as well with the blueberry. We learned that blueberries activate cold receptors just like green tea does. Darjeeling tea worked well with the raisin scone, and also when the strawberry jam was added. This brought out the floral notes. Darjeeling activates the 'warm' receptors, as does the raisins and strawberries, so it makes sense that this pairing worked so well. The best pairing for me was the Black Magnolia tea with the chocolate scone and raspberry jam. It was heavenly! Very balanced, floral, and rich. Why is this? Chocolate and raspberries activate the hot receptors, which is where the black tea falls on the temperature scale. Fascinating, right? In the case of the tea and scones, if you activate both the 'hot' and 'cold' receptors at the same time (say pairing the green tea with chocolate), it clashes, and doesn't work at all. When building a tea and food menu, it's important to take these things into consideration. Of course, it's difficult to offer only certain teas with certain foods, but if you are armed with the temperature receptor information, you'll know how to choose your foods wisely, and create successful pairings. As a class, we decided that the best way to offer successful tea and food pairings is to have a 'tea tapas' restaurant where the diner can choose one tea and one small plate of food at a time. Quick, someone run with that idea! As you can see, this workshop was an amazing experience. I cannot wait to put this knowledge to good use! A huge thank you to Virginia for letting me attend the workshop! I hope I can attend more of them in the future. Thank you so much, Sara, for your thorough fact-filled report from my workshop! I so appreciate your ability to interpret what we did in a clear and entertaining way! Fantastic finds and learning from a scientific angle!